Millions of people suffer from neck, shoulder, and arm pain. While there are numerous conditions that can result in this type of pain, a common cause is a herniated disc. Discs, which act as shock absorbers for the spine, are located in between each of the vertebrae in the spine. Each disc contains a tire-like outer band (called the annulus fibrosus) that surrounds a gel-like substance (called the nucleus pulposus). Dull or sharp pain in the neck or between the shoulder blades, which can intensify in certain positions or after certain movements. Pain that radiates down the arm to the hand or fingers (this is called radiculopathy). Numbness or tingling in the shoulder or arm. Aging. As we get older, discs gradually dry out, affecting their strength and resiliency. History of major or minor trauma to the cervical spine. Lifestyle choices. Lack of regular exercise, not eating a well-balanced diet, and tobacco use substantially contribute to poor disc health. Poor posture, incorrect and/or repetitive lifting or twisting can place additional stress on the cervical spine. Medical history. You doctor will talk to you about your symptoms, how severe they are, and what treatments you have already tried. Physical examination. You will be carefully examined for limitations of movement, problems with balance, and pain. During this exam, the doctor will also look for loss of reflexes in the extremities, muscle weakness, loss of sensation or other signs of spinal cord damage. Diagnostic tests. Generally, doctors start with plain x-ray films, which enable them to rule out other problems such as infections. 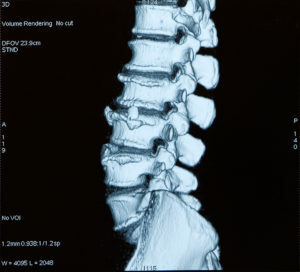 CT scans and MRIs are often used to give three-dimensional views of the lumbar spine and can help detect herniated discs. Pain medications such as anti-inflammatories to reduce swelling and pain, muscle relaxants to calm spasm, and narcotic painkillers to alleviate acute pain. Heat/cold therapy, especially during the first 24-48 hours. Physical therapy exercises such as gentle massage, stretching, and neck bracing or traction to decrease pain and increase flexibility. In conjunction with these treatments, the medical staff will educate patients about risk factors to avoid, healthy posture, good body mechanics, and suitable exercises. Quality education can lead to a healthier spine in the long run. If non-operative measures do not work, surgery may be recommended. 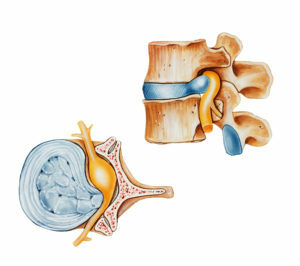 An anterior (from the front) cervical discectomy is the most common surgical procedure to treat damaged cervical discs. The goal of this procedure is to relieve pressure on the nerve roots or on the spinal cord by removing all or part of the damaged disc. During the surgery, the soft tissues of the neck are separated to expose the offending disc. The disc is removed, to decompress the spinal cord or nerve roots. If necessary, the space left by the removed disc will be filled with a bone graft – a small piece of bone usually taken from the patient’s hip. 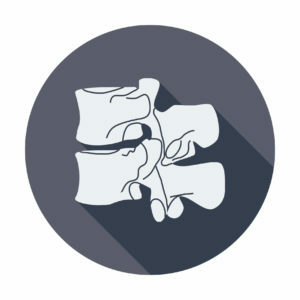 The bone graft is used to join or fuse the vertebrae together. This is called a fusion. In some cases, some instrumentation (such as plates or screws) may be used to help promote fusion and to add stability to the spine. During posterior cervical surgery, a portion of the bone covering the nerve may also need to be removed. This procedure is called a laminotomy. Fortunately, these procedures can often be done utilizing minimally invasive techniques. Minimally invasive surgery uses smaller incisions and tiny specialized instruments such as microscopes and endoscopes. Most patients can begin getting out of bed on the same day surgery is performed! Activity is gradually increased and patients are typically able to go home within 1 – 2 days after their procedure, depending on the extent of the surgery. As with most surgeries, there will be some pain after the procedure. However, doctors these days have considerable expertise at minimizing pain and discomfort. Pain medications will be available to keep you comfortable. At home, you will need to continue to rest. You will be instructed on how to gradually increase your activity. You may still need to take the pain medications for a while. However, pain and discomfort should begin to reduce within a week or two after surgery. Other techniques for reducing pain and increasing flexibility will be discussed with you before you leave for home. When you can return to work and other activities such as sports and driving will also be discussed with you before you leave.